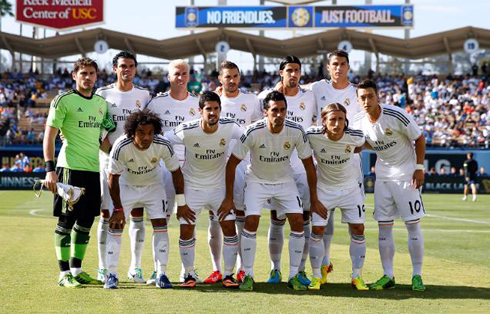 Real Madrid are through to the Guinness International Champions Cup final, after beating Everton by 1-2, in Los Angeles last night. Cristiano Ronaldo returned to scoring goals, after 3 straight games without finding the back of the net. He got the opener just before assisting Mesut Ozil for the second and the Merengues will now face on the final either José Mourinho's Chelsea FC or AC Milan. Cristiano Ronaldo answered Chelsea's boss José Mourinho negative remarks the way he should, delivering a goal and an assist for the Merengues, in their last night's match against Everton. The Portuguese coach had commented earlier this week that he has had the privilege of coaching the "real" Ronaldo (the Brazilian one) in Barcelona back in the Bobby Robson days, in a clear attempt of despising the current Real Madrid superstar and former Manchester United player. CR7 didn't talk about the issue with the press, but showed on the pitch that he won't get affected by whatever might be said about him. Moreover, with this win the Merengues have booked a place in the Guinness International Champions Cup final and their next opponent can be precisely José Mourinho's Chelsea FC, but only in the case the English side manage to get past AC Milan, this Sunday night. 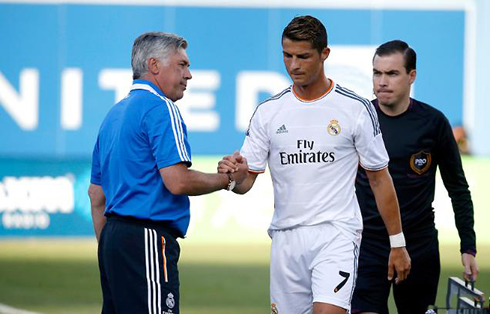 A ticket for the ICC final was on the line and Ancelotti decided to go through into this game with a strong and classic line-up. Spanish internationals Iker Casillas, Sergio Ramos and Arbeloa returned to their starting positions, just like Marcelo and Sami Khedira did. Modric, Isco and Mesut Ozil were left with the task of leading their own side's midfield offensive pace, while Cristiano Ronaldo paired up with Karim Benzema upfront. The opener came up on the 17th minute, on a play similar to many that we've seen in the past few years when watching the Merengues playing. The German international Mesut Ozil charged against Everton's last line of defense, saw an opening for Cristiano Ronaldo to explore and directed him a nicely timed pass that has put him on a 1-on-1 situation against Tim Howard. The 28-year old kept his composure while he dribbled Everton's goalkeeper, and scored against an empty goal just a few seconds later. 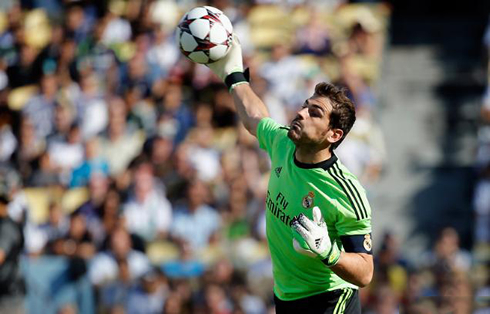 The Merengues were on the lead thanks to their trademark counter-attacks' effectiveness. Around the first half an hour, Real Madrid got their second after benefiting from another great combination between Cristiano Ronaldo and Mesut Ozil. This time around, the roles basicaly switched and it was the Portuguese forward assisting the German playmaker for the second Merengues goal of the night. Ronaldo found himself on a good position to score, but preferred to send over a low pass to Ozil on the middle, which the former Werder Bremen midfielder had no problem in pushing forward towards an empty net. Everton were showing no reaction so far and Carlo Ancelotti's men were closer to assure their presence in the ICC title game, scheduled for next Tuesday night. Half-time came on with the result remaining highly favorable for the Merengues, but the 2-goals advantage wouldn't last long in the second period. Before that, Ancelotti took Ronaldo out from the pitch around the 60th minute of the game to give place to Jese Rodriguez, and curiously, less than a minute later Everton closed up the gap on the scoreline. Roberto Martínez new side pulled off a great offensive play, as they sent the ball through several players in the attack, just before Jelavic's accurate shot got past Diego López, who had already replaced Iker Casillas at half-time. With Cristiano Ronaldo unavailable to help any further from that point onwards, the Merengues held on to the narrow advantage until the end and made sure they wouldn't miss the opportunity to take home this ICC trophy. The final will be played this Tuesday (August 6) and Real Madrid is now only waiting to know weather it's going to be Chelsea FC or AC Milan. 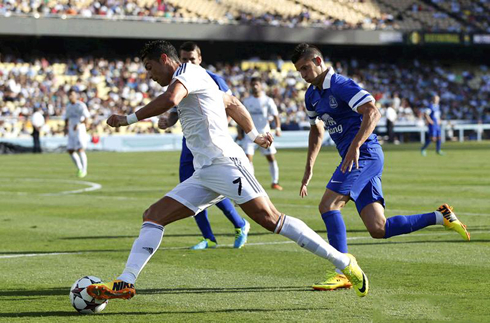 Cristiano Ronaldo next game for Real Madrid will be against Everton, this next Saturday (August 3, 2013), for the Guinness International Champions Cup semi-finals round. In the meantime, you can watch Real Madrid vs Chelsea, Thailand vs Barcelona, Chelsea vs AC Milan and Arsenal vs Galatasaray, all matches provided from our football streaming section.